Americans seem to be more and more over-scheduled every year. We cram our calendars full of work and then wonder why we continue to gain so much weight. It isn’t difficult to see the causes, if you pause and take a look. With sedentary lifestyle on the increase and manual labor jobs on the decrease, Americans are moving less each day. Fewer people stay active at work, and life at home isn’t full of physical activity, either. Many people get home from a desk job only to sit down and watch television. Many people don’t even stop working when they get home; they get right back on their computer and begin again. 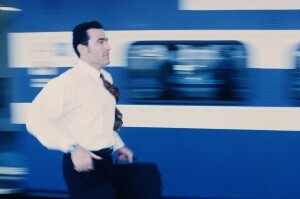 When you are always on the go with a busy schedule, it may seem impossible to find time to exercise. However, that is simply not the case. Incorporating a little exercise into your daily work schedule can help make being more active a routine. It’s a lot simpler than you think! You’ve heard it a million times. But have you ever actually done it? Take the stairs at work instead of the elevator and burn some extra calories. If you get into the habit of taking the stairs, you will probably feel more alert at the beginning of the day and will soon notice yourself being able to walk the whole set without getting out of breath. 2) Don’t park at the front. Instead of desperately searching for the closest parking spot to the store, just park in the back. Those extra steps could make all the difference – recent studies have suggested that even 150 steps a day could work towards preventing Alzheimer’s disease. 3) Take advantage of your lunch break. Instead of going out to eat for lunch, pack your own lunch. That way you will have time to take a short walk during your lunch break. It may sound crazy, but it’s really a good idea! Walking helps improve your focus, which means you will be ready (and maybe even excited!) to get back to work when lunch is over. Why do you want to improve your health? Are you overweight? Do you have diabetes? Are you at risk for heart disease? Do you just feel sick? There are many different reasons people choose to become active, and nearly all of them revolve around health. Post your goals somewhere you will see them daily, whether it be your bathroom mirror, your car dashboard, or in your phone. If you remember why you wanted to get active in the first place, chances are you will be more likely to stay active in the long run. Although it may not seem like it, taking little steps like skipping the elevator can make a big difference in your health. The key is to stick with it once you’ve started. The more you exercise, the better you will feel. Long Term Care Insurance will protect your health should anything happen to you, but it is just as important to maintain your health once you have purchased a policy. A strong link has been found between obesity and the need for long term care. Following these tips can help keep physical activity a daily part of your life, while keeping long term care out of your life, making you healthier and happier!